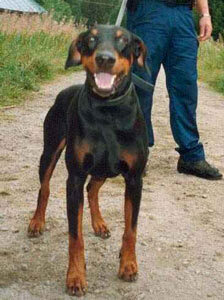 Bastian von der Doberwache was a police protection, drug and explosives search dog in Finland. His dam, Kleo von der Weyermühle, was a German Police dog who also won the working IDC World Championship in 1996 and his sire, Gero von der Mooreiche, was runner-up at the D.V. Meisterschaft in 1992 and 1996. Bastian's sire lived to 12 years of age and his dam lived to almost 13 years of age.